April 2015 – Page 2 – Let's Go RVing! What a bumpy night. For some reason I was tired and sleepy last night so I turned in early. I had planned to watch the third installment of A.D but didn’t realize that it would come on at 8:00 instead of 9:00 since we are in Central time. When I realized that I had missed it I just turned off the TV. Guess since we’re headed to Nashville I should have watched the CM Awards show. Wind and heavy rain woke me up during the night. In fact it was so bad that I wouldn’t have been surprised to hear a knock on the door telling us to move to their safe place. We got up about 6:30, read and drank coffee in our usual silence. When we have the time it seems to take us more time to get it together. Jerry had sent me the e-mail from Lowe’s so I tried to go on line to pay the bill. As usual I had the frustration with US Cellular hot spot so no bill was paid today. US Cellular worked great in Tennessee but not in Kentucky. When we get home I’m going to seriously look into Verizon for my phone. We’ve done our touring in Kentucky for a while so the fact that it doesn’t work well here isn’t important. The weather is terrible. Jerry remarked this morning that he didn’t know what the annual rain fall for Kentucky is but it certainly does rain every time we are here. It’s also windy and in the 50’s so I can’t imagine what kind of touring we’ll do. If we hadn’t paid for tonight I’d suggest going on to Nashville but then it’s mighty windy to drive. At least I could get caught up on my journaling but nothing of note to tell! 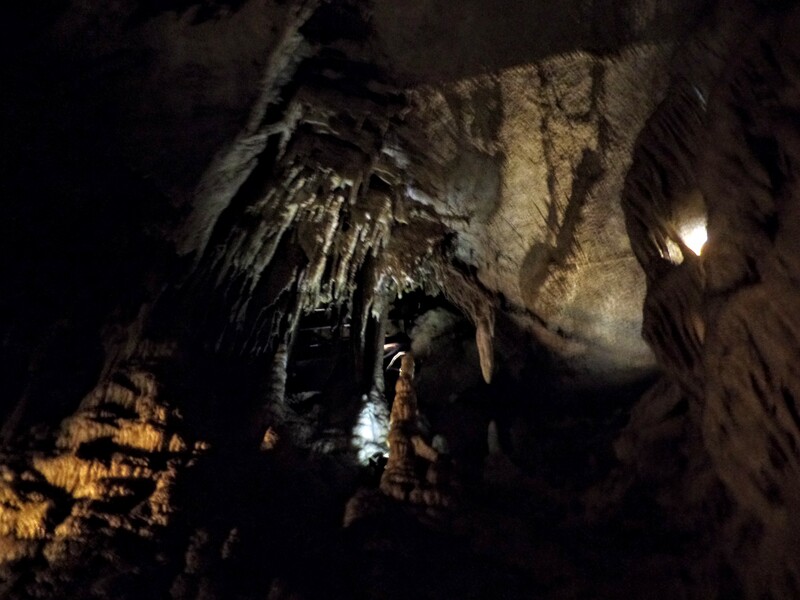 We decided to brave the weather and go visit Diamond Caverns. Along the way we went by the Visitor’s Shop at the Mammoth Cave Hotel and purchased the rocking horse that we had seen earlier. Now to get it to PB in one piece! We also stopped by Ed’s Rocks but it was closed. The owner had unexpectedly died recently and everything is going to be auctioned off this week-end. From the looks of things they had some items Jerry might have been interested in. 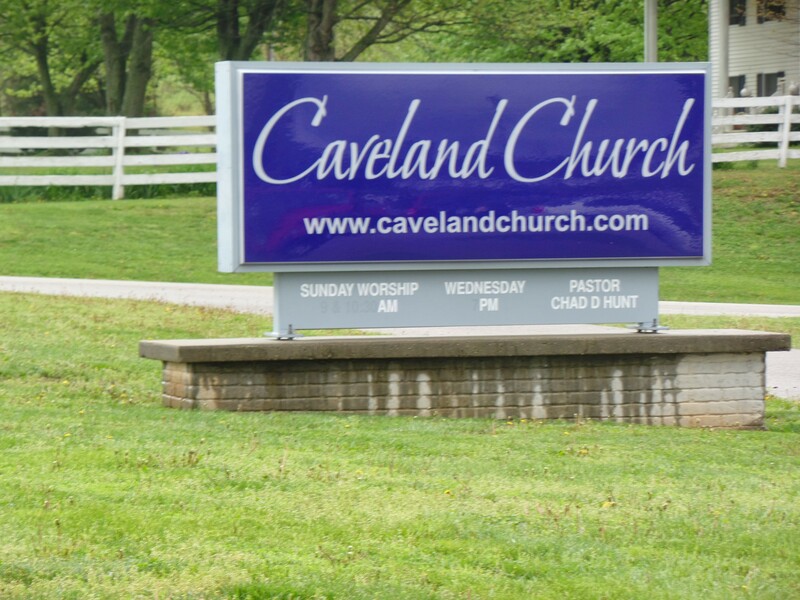 We went on to Diamond Caverns. Apparently we got there just as the tour left so we had about 30 minutes to wait. We wandered around the shop and talked with the clerk. I mentioned to him that I had asked at Mammoth Cave about the difference in a cave and a cavern. He initially gave me the same answer – and “R” and an “N”. He went on to say historically a cavern only had one entrance while caves had several entrances. He did say that was not so much the case now. Our tour started with our guide Wyatt and only four other people although one dropped out after just a few minutes. He has a fear of bridges and was unable to walk over even a small bridge so he turned back. Quite frankly I wondered if I could keep up because my legs were still pretty sore. I made it and hope I can get out of bed tomorrow! The cavern was more impressive than Mammoth Cave. It was much prettier and with only five people I didn’t feel like cattle being herded plus we were able to freely ask questions. 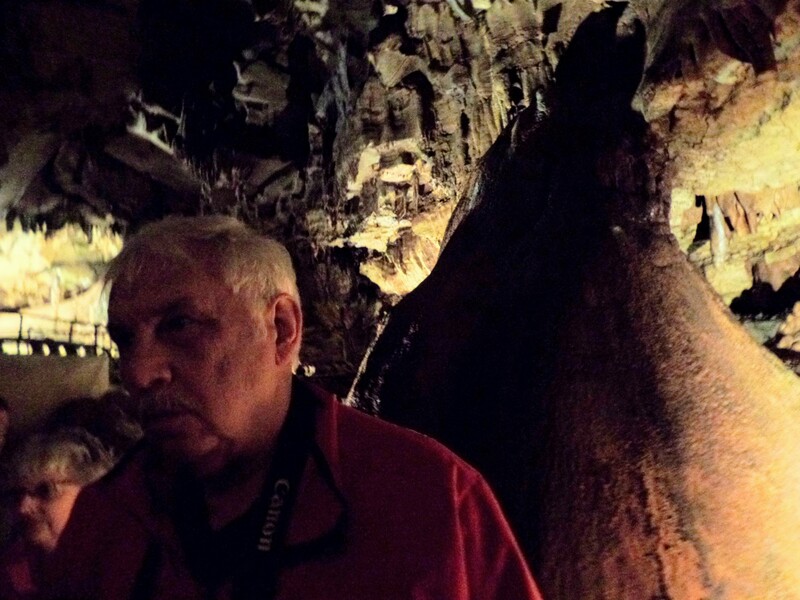 If you can only do one tour go to Diamond Caverns. 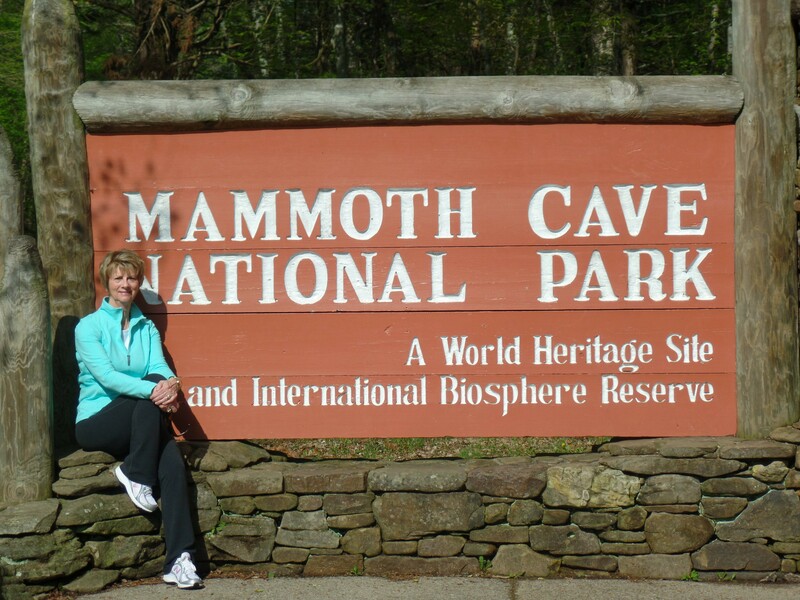 It is privately owned and the 2nd largest privately owned cavern in the US. Three couples, all geologists bought it in 1999. After the tour we came back and had a late lunch. We read for a while and then just as I was getting up to get ready to go out to eat Trent called and then Helen Jo. After the calls I quickly got ready and off we went to Anna’s Greek Restaurant. We joined Sheryl and Ted along with Ted’s cousin and his wife. We shared appetizers of Calamari Fritti served with fries, Meatballs – Kefdethes, and Feta Cheese. For dinner I had Venetian Style Tenderloin smothered in a Metaxa cream sauce with caramelized mushrooms (divine sauce) and Jerry had Youvetsi (beef chunks braised Greek style in red wine). Both were very good. Both couples are full-timers. It is interesting to listen to them talk about their experiences. Ted’s cousin whose name I can’t remember said that when they first started RVing they would drive about 300 miles, pick a location and stay for a month and really get to know the place. When we got back to the RV we put the car on the dolly and Jerry hooked it up so leaving in the morning will be quicker. He also emptied the gray tank and the front black tank. Nashville is only about 80 miles away so hopefully we can get there, get set up and do some site seeing tomorrow afternoon. It’s only a bit after 8:00 but think I’ll get ready for bed now. I’m still not used to the time change and I guess by the time my body acclimates we’ll be in Memphis where it’s EST. Since we had been going non-stop since we got here we had pretty much seen all we wanted to see and rain was threatening so we just ran a few errands. We went back to the Apple Barn and Tanger Outlet. Jerry had wanted to go to the Direct Tools store there but he must have been a bit disappointed because he was in and out in no time. I ran in Bed and Bath store and bought some liquid soap and then we went in the New Balance store. I finally ended up buying a new pair of tennis shoes, a ½ size smaller than what I usually wear and a new pair of jogging pants. It had started raining by then so we came on back to the coach for lunch. I warmed up the hamburgers we had earlier and cooked some fries. We left then and rode to Sevierville. 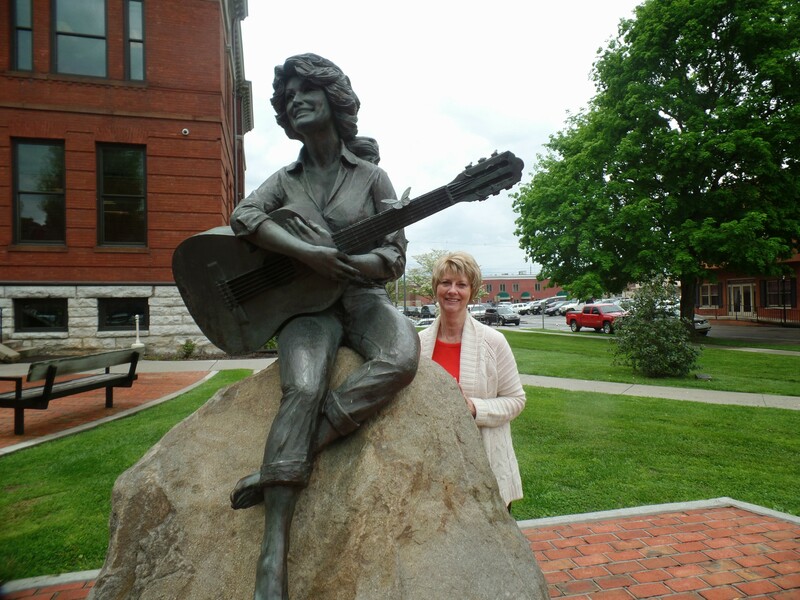 I wanted to see the statue of Dolly Parton that is in front of the Court House. Why, I have no idea but we stopped there for a few minutes. Left there and went to another tool store that Jerry had seen across from the knife store. I sat in the car while he shopped and was surprised when he eventually came out with only a $6 purchase. We talked about going to the FoxFire Swinging Bridge but it looked like it might begin raining again so we scratched that idea. We went to Walmart to pick up some groceries – seems like we always need something – and then back to the rig. We went on and put the car on the dolley and pulled the awning in. Jerry emptied the gray tank and the front black tank so all he will have to do tomorrow is flush out the back black tank. Hopefully we can get up and out early in the morning as we have about 250 miles to Cave City. Wednesday started out as every other day – slow. It seems to just take us a while to get coffee and breakfast, get dressed and out the door. We decided to start earlier today so we left by 10:05! Jerry wanted to buy a lens cover (or two) for his camera so we went on a hunt for a camera store. The first one we went to was supposed to be in Pigeon Forge but apparently it is closed because we never found it so we headed out for the second one in Gatlinburg. It too was closed so we turned around and headed back to Pigeon Forge for the third store only to find out that it too was closed but they did have a mobile unit that would come if called. We just gave up and headed into Old Mill Shopping Square. We went in a couple of stores and I’m sure there are many more interesting ones there but it had started to rain so we headed out to the next stop, Smokey Mountain Knife Store. It is a huge store with most anything relating to knives but I just wanted a paring knife – and I found one but it was $29 and I just couldn’t talk myself into spending that much money so I bought one for about $5.00. We also bought some sweet onion relish hoping that it will be as good as the jar we bought in Yemanasee, SC. On our way back to the coach we stopped at Kroger’s and bought a few groceries. We rushed back to the RV Park to eat a quick lunch, and try out the onion relish as we had to be at the Majestic Theater by 1:30 for a show, the Soul of Motown. After checking the weather Jerry suggested that we wait to leave for Mammoth Cave on Friday so we had to go by the park office to see if our site was available for one more night. It was so we headed on out to the show. It was absolutely fantastic. The vocalists were fantastic, the harmony was right on and the songs sounded just like the original recordings and they even let us sing along with them when they came down into the crowds. We bought a CD and will be jamming on the way to Kentucky! After the show we went to the Christmas Shop in Pigeon Forge billed as the largest Christmas shop in the South. It was nice and big but nothing special. We were able to get ornaments for the grandkids for next Christmas – now to remember that in December. We came on back to the coach then. We sat outside and visited with the new neighbor. Someone was moving in across from us and he was having some difficulty so Jerry helped him. Since the weather was so dreary we had decided on chicken pastry for dinner and it hit the spot. After dinner Jerry went outside for a while. After cleaning up the kitchen I went out to join him but it was too cool for me so I came in and got ready for bed. Trent, Eva and Britt FaceTimed with us and we had a nice visit. It’s not the same as being with them but it surely is nice to see their smiling faces and hear their sweet voices. Eva had gone for her test at Parrott so she talked about that. Britt’s first words were “where is PaPa?”. After the phone call I played on the iPad for a while and then fell asleep listening to a podcast. We got a late start because we hadn’t quite decided what we were going to do today. Also, it was raining so that entered into the decision making. We finally decided to go on to Cades Cove and just drive through the rain. Fortunately for the most part it only sprinkled a bit. 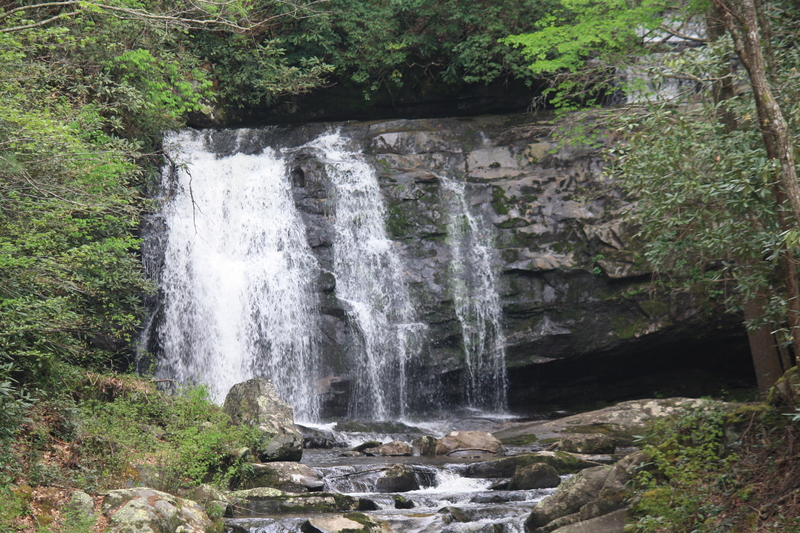 We drove the 25 miles from Gatlinburg thoroughly enjoying the beauty of the day and the surroundings. Gorgeous white dogwood trees sprinkled the landscape just adding to the depth of the beauty. After a brief bathroom stop we entered the 11 mile one-way loop known as Cades Cove. As was the drive from Gatlinburg the scenery was absolutely beautiful. Our first stop was the John Oliver Place, a one room house built in the 1820’s. Parents, infants and daughters slept on the first floor and sons slept in the loft. The stone chimney is held together with mud mortar as were the chinks of open spaces between logs. It began to sprinkle as we were leaving but we were only about a 1/4 mile from the car. Our next stop was the Primitive Baptist Church. Fortunately we were just in time for the brief program giving the details of the church. One of the outstanding features of the church was the hand prints on the ceilings. The boards, different sizes, were prepared before putting up so the worker’s hand prints were on the boards. There were also small hand prints where children had been with their parents. Another interesting fact was that the church split over desires to help missionaries so the Missionary Church was started. The Primitive Baptist looked after each other whether in sickness, hard times, destruction, etc. and didn’t see a need to help missionaries. It had begun to rain pretty hard by then so we skipped the Methodist Church and the Missionary Baptist. It was also pretty foggy by then. We wound around the one lane road passing the Elijah Oliver Place and stopped at the Mill Area which was a walking tour. One of the prettiest structures was the grist mill where they still ground corn to make corn mill. It has no additives. Jerry bought a small bag and we’ll try it out when we get home. Afterward we continued our winding tour stopping at a beautiful place to have our sandwiches and chips. Jerry was once again taking pictures so I mentioned that the pictures that people keep and ones that have meaning usually have people in them so he suggested that I get out and get in the picture. I did and then he said I should be frolicking so he took a pic of me acting foolish. A lady in the car parked next to us (whom I obviously didn’t realize was there) said I should have been singing “The hills are alive” and quite frankly the scene did resemble the last scene in The Sound of Music. As we continued on our ride Jerry said something about going to the Dixie Stampede tonight. I suggested that we wait until we got back to call to make sure we had plenty of time to get there. We couldn’t have called anyway because we had no cell coverage the entire we were gone. Jerry was looking for a particular water fall that we had seen going in and when we found it we stopped and took some more pics. Afterward I fought sleepiness. I wasn’t really tired but I was SO sleepy. When we got back to Pigeon Forge we stopped at the Dixie Stampede and there were lots of people already there. Come to find out there is a pre-show at 5:00 with dinner and the Stampede starting at 6:00. It all was a lot of fun. I got a virgin strawberry daiquiri in a boot and it was so cold and icy that I ended up drinking it during the entire pre-show. The actual show was good and the dinner was quite good, much better than last night’s but … we had to eat with our fingers. When they poured the soup my first thought was where is my spoon and then realized that I had to drink it. That was no problem but eating chicken with my fingers – well if I ever go again I’ll sneak in a fork! We were back at the coach by 8:00. Jerry wanted to go for a walk but I was just too tired so I readied for bed and was asleep a little after 10. Monday morning we got up, had our morning coffee and discussed where we would spend the day. 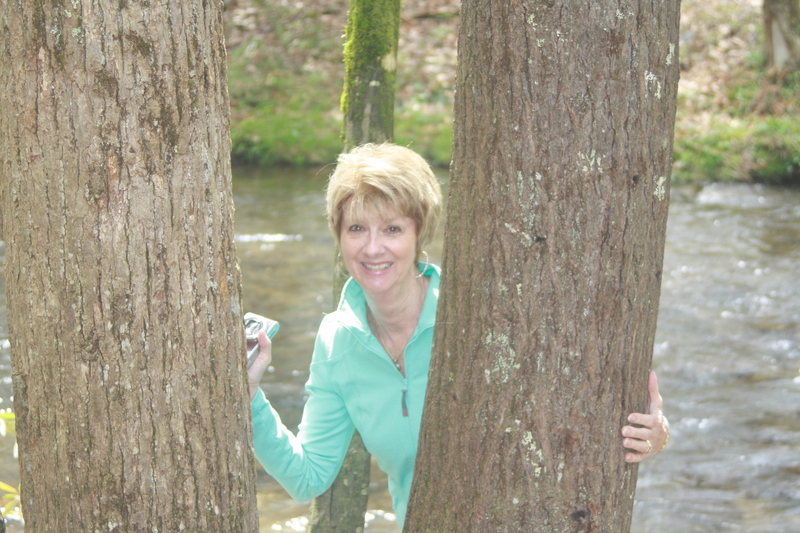 We elected to head out to Cades Cove but had no idea how to get there except to head toward Gatlinburg. I couldn’t find any addresses for the Visitors Center so we just headed on. We finally found a Visitors Center (by accident) and went in. They directed us toward Cades Cove where we went to the Sugarland Visitors Center. It was lunch time and the ride to and through Cades Cove is pretty long and we were not sure about food availability so we turned around and went to Gatlinburg. We rode down the main street and then settled on lunch at the Park Grill. We had the salad bar and split a burger. It wasn’t very good to me and a bit pricey for lunch but we were able to remain parked there so I included the going rate ($8) and decided it wasn’t quite as costly as I had thought. We walked down the streets of Gatlinburg and eventually ended up at the Sky Lift and decided to go on and take the ride. It was so nice and peaceful, quietly and gently moving up to the top. When we got off we wandered around up top for a bit, took a couple of pictures, just enjoyed the view and then made our way back down. It was so peaceful I think I could have fallen asleep. 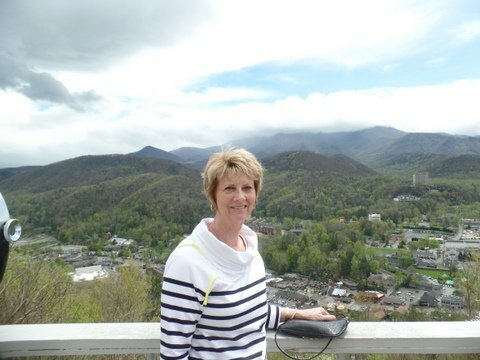 As we continued to wander down the main street of Gatlinburg I reminded Jerry that we were going downhill, meaning that we would be going uphill going back to the car. At that point we decided to turn around! We got back to the car and then came on back to the RV. We rested, freshened up and took off to see the Day of Elijah at the Biblical Times Musical Theater. For some odd reason we had to be there at 5:00 but they didn’t even open the doors until nearly 6:00. Before everything started one of the performers was walking around talking with people. Somehow as he was talking to me he mentioned riding and I asked what kind of horses he rode. Would you believe he said “saddlebreds”? I mentioned that we had just come from a show in Raleigh and he mistakenly thought it was the spring premier and he said his friend Annika had shown there. He also mentioned Melissa Moore. Small world. He showed me a picture of him showing his horse and he looked really good. The Day of Elijah was good and the vocalists were outstanding. The dinner, not so much. The roll was pretty good! We got back to the coach about 9:00 and I realized that I had missed a FaceTime with Trent and Eva and Britt. Got ready for bed and turned in as we have a full week ahead of us. Got up Sunday morning around 7, had our coffee, showered, dressed and then began breaking down. We pulled out of Raleigh at 9:23 headed for the Tom Johnson campground in Marion. It’s a beautiful day although a little cool. The sun is behind us so that makes working on the computer easier. The bumpy road though is a problem. The cursor jumps all over the place. It will be interesting to re-read this after we get stopped for the evening. Since we are unfamiliar with the GPS in the coach we are using two – the Magellan on the coach and the Garmin. Garmin says we’ll arrive a little after 12:30 and the coach says an hour later. Don’t quite understand that but guess we’ll see who is correct. Well we got to Marion only to discover that we couldn’t find the campground! We rode past Tom Johnson Camping Center but saw no campground and there was nowhere to turn around. Jerry just pulled off the road while we decided what to do. I called both numbers on the webpage but only got a recording saying they were closed on Sunday. 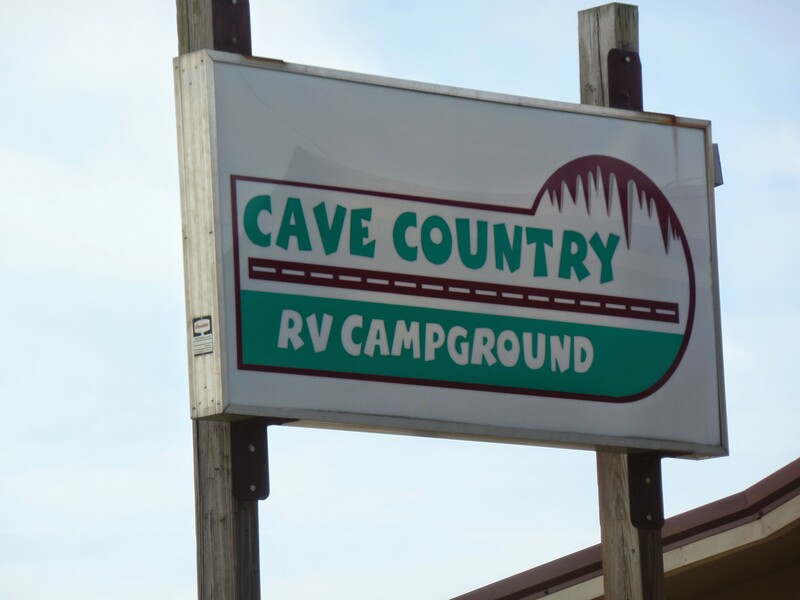 I began “chatting” with Anna on the webpage but couldn’t make her understand that no, I didn’t have an appointment, that I was checking into the campground where I had made reservations a week earlier, that I didn’t have a vehicle that needed work, etc. She finally asked for my phone number and e-mail address and said she would look into the problem and get back to me. We made sandwiches and discussed the problem and decided that since it was only 125 miles to Pigeon Forge we’d go on. We turned the GPS on for Pigeon Forge and it continued us down the two lane road. We knew that there must be a four lane so we turned around to get back to Interstate 40. As we rode by Tom Johnson Camping I saw the campground in the very back but it was gated and we had no code so on to Pigeon Forge we went. I called Riverbend and they said we could come on in and if the office was closed to just go to Site 110 and check in in the morning. We got back on 40 and headed toward Black Mountain. I sat in the floor and played with the GPS some more, learned a little more and avoided looking at where we were going! Black Mountain is tough to navigate. The ride was nice, mountainous but four lanes. We were getting low on gas and finally saw a sign for a Marathon. Thinking it would be an easy on and off we exited. It was not difficult but it was a couple of miles down the road. Jerry only got $60 worth because the pump was so slow. We took off again and then made the exit onto a double lane, curvy, oh my gosh it’ll take forever road. Many RVers say to stay off the four lanes and go on two lanes because there is so much more to see. Jerry does not agree! We finally got on a four lane and arrived at Riverbend around 5:30. I checked in and found they only take cash, check or debit – no credit cards. We went around to Site 110 and found it occupied so I went back to the office and she gave us a choice of several sites and said just to let her know which one we chose. We chose 93. It has a concrete pad, no trees but unfortunately I don’t think we’re going to be needing any shade this week as the forecast calls for a lot of rain. We got set up and Jerry decided to grill the chicken we had thawed. We already had potato salad and I fixed some baked beans. I hate to say it because my next attempt may be a bust but my baked beans turned out good too. I am learning a bit more about the convection oven. We ate outside on the picnic table. It was a very pleasant evening, just the right temperature. We are across from a stream and the sounds from that are so soothing. After dinner we walked around the park and then came in just before dark. I got on in bed because I wanted to watch the second installment of A.D. Hopefully I will be able to watch the rest of the show but I am not sure I will be able to watch the horrible cruelty inflicted. It is beyond comprehension to me.